You asked, and we listened. 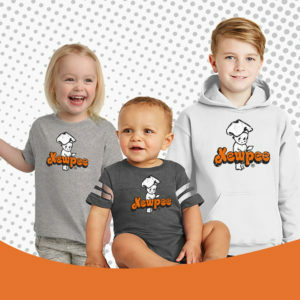 We are so honored that you, our customers, would like to purchase Kewpee Hamburger apparel. We have finally made that a reality. Please check out the categories below and browse our selection. 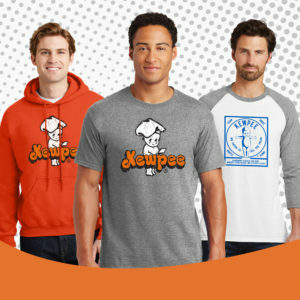 We are happy to announce you can now “pick up” your Kewpee apparel order! If you choose “Customer Pick Up” you will be notified via email when your order is ready for pick up. Production time is 10-15 working days. Pick up will be available M-F from 10:00am – 2:00pm at 1207 Findlay Road, Lima, OH 45801. We have chosen an off-site store format to fulfill our orders as we want to keep our restaurant experience just that, as a restaurant. Our goal is to not complicate or slow down the food ordering process. Thank you for your support and understanding! short sleeve, pullovers, polo, long sleeve, and 3/4 sleeve. Choose a variety of designs from the standard Kewpee Hamburgers logo to the retro Hamburger Wrapper logo. short sleeve, pullovers, polo, long sleeve, and 3/4 sleeve. There are also a variety of designs from the standard Kewpee Hamburgers logo to the retro Hamburger Wrapper logo. short sleeve, long sleeve shirts, hoodies, onesie. We have a variety of designs from the standard Kewpee Hamburgers logo to the retro Hamburger Wrapper logo. Check out these unique items. 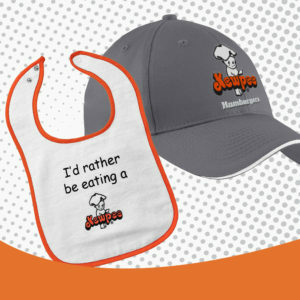 Hats and baby bibs. 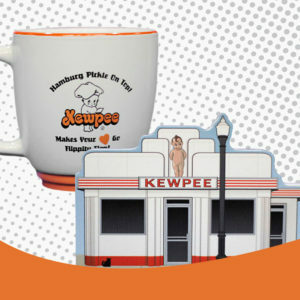 Kewpee Collectibles are the perfect gift for your loved ones. For any questions and concerns, please direct your inquiries to 419-224-8747 between the hours of 9:00am-4:30pm Monday through Friday. You can also send an email to psa.graphics@proforma.com. The prices offered in the online Store and in our retail stores may differ. The Site and stores may choose to offer items at different prices or may run different promotional events at different times. For this reason, prices and promotions (e.g., promotion codes or free shipping) offered by the online store may not always apply in stores. Store prices and promotions (e.g., coupons or additional discounts) may not always apply on this Site, unless otherwise stated.